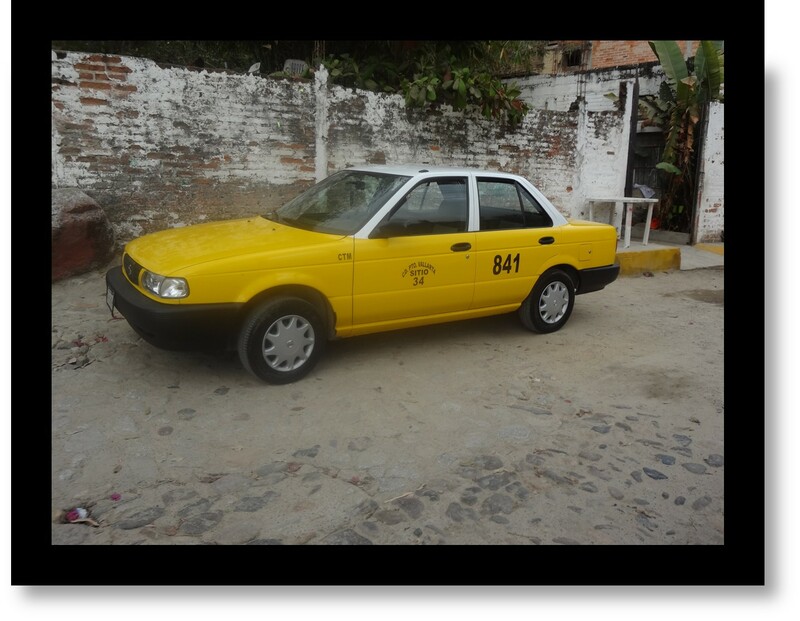 As Puerto Vallarta is a tourist town, there is never a problem finding a taxi. You can find taxis just about anywhere and at any time of the day or night. Just step onto any street curb and wave as one approaches, or ask your resort or restaurant server to call a taxi for you. Before you step one foot inside the taxi be sure to ask the driver how much it will cost to take you to your destination, because if you wait until the end of your trip it will be very difficult to negotiate. Fares in Puerto Vallarta are starting to be more consistent than they were in the past, and in most cases the driver will charge the correct fare. The minimum fare is $50 pesos. Your resort should have a rate sheet at the front desk, and every taxi driver should have one available in his vehicle that can be produced upon request. The rates taxis charge are per destination for all passengers within the cab; rates are NOT charged on a per person basis. Airport taxis are not the same as regular city taxis. Airport taxis are more expensive than regular city taxis and have a completely separate rate chart. If you only have large bills and know ahead of time that you’ll be needing change from the driver, ask the driver BEFORE you enter the cab if he will be able to make change for you. Somehow it seems that taxis don’t always have enough change on them, and you may end up leaving your driver an unexpected “tip” when you reach your destination if it’s claimed that he cannot break your larger bills because he unfortunately does not have the correct change. Below are just a few of numerous taxi rate charts for city taxis serving Puerto Vallarta and Nuevo Vallarta. The rates displayed are for a regular-sized taxi (taxi vans will cost more). The top of each rate chart will show the rates that apply based on where the taxi is hailed from and your final destination. Each taxi has a rate chart within their vehicle, and the driver should agree to show it to you upon request. I’ll keep gathering taxi rate charts and posting them here. In the meantime, the charts below should you an idea of what you can expect to pay when you take a city taxi in Puerto Vallarta and in Nuevo Vallarta, Mexico. Keep in mind that taxis charge per vehicle, not per person. For the best rate be sure to pay in pesos. Whenever you pay in dollars the exchange rate used is 10:1. It’s always a good idea to carry several small bills with you at all times; this will come in very handy in the event your taxi driver claims that he does not have enough smaller bills to make correct change for you. It is not customary to tip taxi drivers unless they have assisted you with your luggage or groceries, or have really gone above and beyond the call of duty. A yellow taxi in Puerto Vallarta, Mexico. As you enter the taxi make a note of the cab number and sitio number (sitio refers to the taxi stand location). 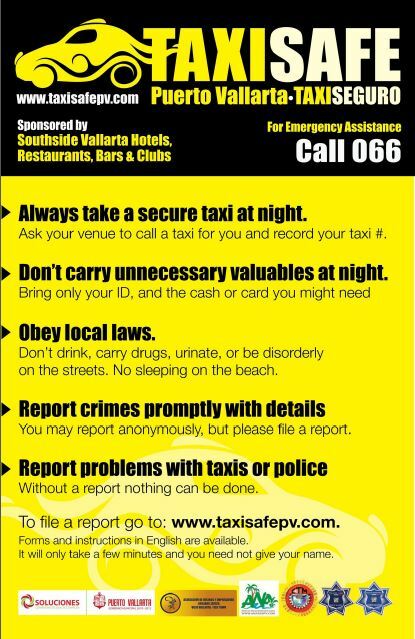 In the event you leave behind a personal item in the taxi, this information will come in very handy! There are plenty of options for renting cars in this popular tourist area. But pay attention to the fine print. Before putting down any money, make sure the excellent rate you are considering includes taxes as well as liability and collision insurance. Many companies tack on these extra fees to the rental contract on the day you arrive to pick up the vehicle. Information on renting a car is available on the Rental Car page. Information about driving in and around Puerto Vallarta, to include rules of the road, is conveniently found on the Driving in PV page of this site. Puerto Vallarta has really wonderful public transportation. Buses normally run about 10 minutes apart. Visitors find that it’s both easy and economical to get around the various areas of Puerto Vallarta and Banderas Bay by bus. Very quickly you’ll notice that some of the buses in Puerto Vallarta are newer vehicles with very comfortable seating, while others look pretty old and beat up. If you are planning on traveling a long distance and wish to do so in comfort, then you have the option of not boarding any of the rickety-looking buses coming by and instead wait for a newer bus with more comfortable seating. If you’re just going a short distance, then it’s often best to just board on the first bus available that’s heading to your destination. The way you know where a bus is going is by reading the locations hand written on the front windshield. If you are ever in doubt, when a bus stops you can quickly ask the driver if your destination is on his route. The entry and exit points on the buses are very high and persons with certain physical disabilities may likely find them difficult to board. When you wish to get off a bus while it’s in route, simply depress one of the buttons (timbre) found near the exits. It’s important to note that the doors on these buses are not equipped with movement sensors or automated mechanisms, which means if you’re moving too slowly or stop and hesitate for a bit, you’d better watch out because the door will begin to close up on you. In Puerto Vallarta you will notice that there are several different colored buses throughout the city, and some have overlapping service areas. There are two primary bus companies which are responsible for servicing points within the city of Puerto Vallarta: one company has blue/white buses and the other has green/white buses. The windshield of each bus lists the destinations they are headed to. Although the government does have an actual bus schedule detailing all the various routes and fares, one would be hard pressed to find a paper-copy handout available for tourists. The on-line website Rutas Vallarta can be quite helpful in figuring out routes but it will require you to have internet access. There are different buses which service areas outside the city. ATM (Auto Transportes de Medina) buses transport passengers to areas north of PV such as Nuevo Vallarta, Bucerias, Punta Mita, etc. Older ATM buses are gray, while newer ATM buses are white; both gray and white ATM buses have a short red-and-blue striped emblem on the sides. ATM buses heading north stop to pick up passengers at Plaza las Glorias in front of HSBC Bank (across the street from Coppel department store), in front of the Walmart/Sam’s Club complex (across from the maritime terminal), under the pedestrian bridge across from the PVR airport, and in front of the large Corona facility north of the airport. Compostela-Pacifico has green/white buses that travel north to Sayulita, San Pancho, and Rincon de Guayabitos. But just to be clear, not all Compostela buses go to Sayulita. Within Puerto Vallarta heading north, the Compostela buses pick up passengers at the same stops just mentioned for the ATM buses. Then there are orange-colored buses. These orange buses travel to areas south of PV such as Mismaloya and Boca de Tomatlan. For long-distance routes, Mexico has a great long-distance bus system via various transportation carriers. Beautiful and luxurious ETN buses transport passengers in comfort and style to more distant locations such as Guadalajara. Other comfortable but less plush long-distance carriers are Primera Plus and Vallarta Plus. Groupo Estrella Blanca operates their own bus lines such as Elite, Elite Plus, Turistar and a few others. Now if your head is spinning with all of this information about different types of buses, don’t worry! We’ve created a cheat sheet for bus routes and bus fares to help you get to and from the most commonly traveled places that tourists want to go within Puerto Vallarta and the surrounding area. Newbies to Puerto Vallarta often expect to find chickens and livestock being transported on public buses along with human passengers; that’s a thing of the past except for buses in rural areas outside the city. What tourists will find is this: Using public transportation is a cheap, fun and very convenient way to access many exciting points of interest within the Banderas Bay area. And, just like hopping into a taxi cab, using the city’s buses it’s a very safe transportation option. It’s of interest to note that the buses in Puerto Vallarta are driver-owned vehicles. The more passengers they are able to transport during their shift, the more money the driver will be able to make. The stopping and starting can be quite abrupt, as all drivers want to quickly load in passengers at each stop and then just as quickly enter the road again. Whenever you get onto a bus it’s best to have the correct change ready as this will help speed up the process. The current price to travel to most areas within the city is 7.5 pesos (2014), without prices to outlying areas being higher. Bus transfers are not available. When you pay the driver upon boarding, he should hand your a small slip of paper which is a receipt. These receipts help the transit authority keep track of the income generated by each bus. As soon as you board you’ll want to sit down quickly and hold on tight as these buses often take off like a bat out of hell. Please remember that two seats directly behind the driver are reserved for pregnant women, the elderly and the physically challenged. One fun thing about riding the bus is that sometimes musicians and other entertainers will board the bus and perform for tips. Helpful information on bus routes can be found on our page Bus Routes and Bus Fares.